For a moment, imagine what it feels like to hung up and unable to move because one's body has been paralysed by a severe electric shock. Imagine next what it feels like to be butchered by having one's throat cut - while one is still fully conscious. Pigs are gentle, sensitive, intelligent and highly social creatures. They are functionally equivalent - both in their intelligence and capacity to suffer - to human infants and toddlers. The British meat industry kills about 15 million pigs each year. The full horror of their gruesome deaths defies easy description. Slaughter first involves 'stunning'. This is followed by throat-slitting. Throat-slitting is also called 'sticking'. The terrified animals are usually stunned electrically by placing tongs on either side of the neck behind their ears. In many cases, the 'stunning' is inadequate. This is because the tongs are not held in place for long enough. In numerous other cases, the tongs are 'incorrectly' placed. Typically, the voltages used are insufficient. 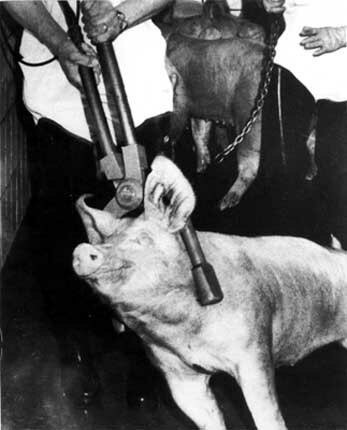 In consequence, many pigs regain consciousness during bleeding-out, or even before throat-slitting. Thus our victims die agonised and terrified deaths. British meat crisis: has BSE spread to sheep?